Do you need to see the whole tie before you know if you are interested in it? 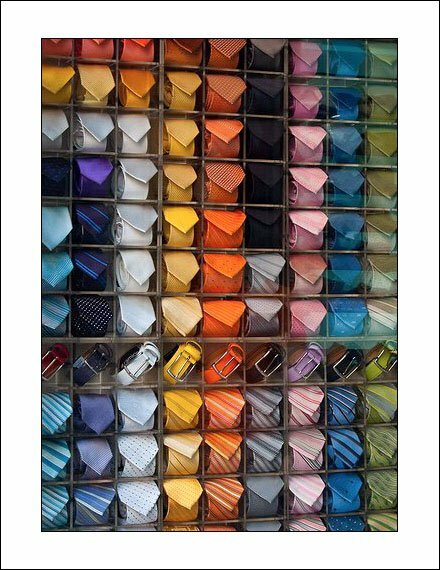 This Periodic Table of Neckties, a rack of cubby-holed color neckties and belts implies not. And in truth, even though not a tie guy, I was attracted to it, and would first shop by color, then by pattern. Maybe retailers could save a great deal of space using a merchandising concept like this? Beyond the space savings I loved the ability to display color in such an organized, Periodic Table fashion. But then maybe that’s just the engineer in me. This concept courtesy of Anne White’s Display Pinterest Board.